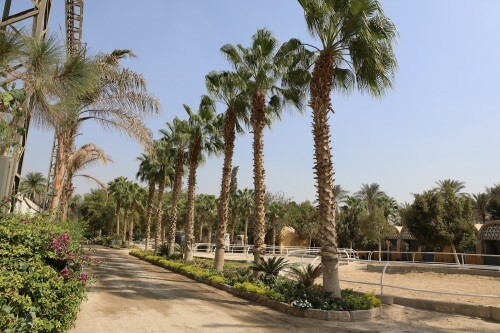 As you stroll through Rabab Stud the sun disappears under the wonderful dark green palm trees and everything seems to be bathed in a golden light. There is a friendly welcoming atmosphere, which you felt even on the first day of the annual Rabab Championship. But today it will be exciting; it is the day of the final championships. When the sun has fallen the bright spotlights in the arena light enchanting Arabian horses. Now comes the important moment. First impressions are everything when the horses enter the arena and the judges are looking for that special individual that enthralls the crowd, too. 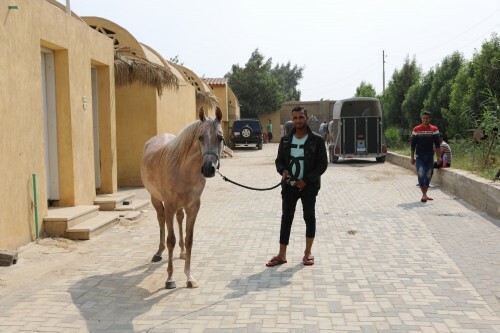 Presided over by Sheikh Khaled Mohamed Awad Bin Laden, owner of the Rabab Stud in Sakkara, the Championship has become an important date on the calendar for many breeders in Egypt. This year, especially one stud farm stood in the spotlight: Al Bawady Stud achieved two times gold, silver and bronze medal each. The championship day began for Al Bawady Stud with an unanimous vote of the judges for Fardous Al Bawady, by Madeen Al Nakeeb out of Feryal Athbah, winning Gold Champion Yearling Filly. Silver went to another Madeen Al Nakeeb filly, Samraa Athbah owned by Athbah Egypt. While Ghalia Al Gammal, by Mirajh RCA, won Bronze for her breeder Al Gammal Stud. 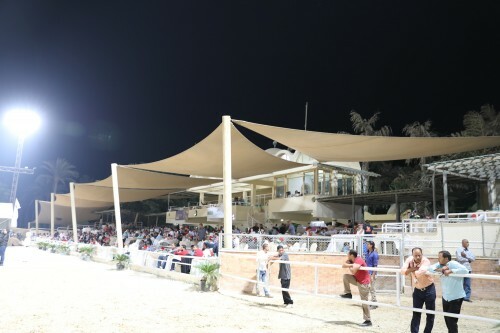 Al Bawady Stud recorded another success with a Madeen Al Nakeeb daughter in the Junior Fillies Championship, when their Samara Al Bawady garnered Silver, bested only by Warda by Jassar, by EKS Alihandro, born in Italy and owned by Athbah Egypt, who also won Bronze with Dareen Athbah. Al Farida Stud’s charming Sayedah Al Farida, by Said Hafid El Chamsin out of Imperial Baalanah, took Gold Champion Senior Mare. Silver and Bronze went to mares owned by Al Bawady Stud: Bint Hamsa, by Ansata Malik Shah, and her stablemate Mona Al Bawady, by Barakat Al Khalid. The Yearling Colt Championship saw a tie for gold and silver, however, the choice fell for Tamim Al Bawady, by Hamad out of the excellent producer Wasfeya Al Bawady, winning Gold Champion Yearling Colt. Bronze went to Marawan Al Bawady, by Madeen Al Nakeeb, bred by Al Bawady Stud but proudly owned by Sika. The Bady Al Masry son Gamil Hanafi garnered Silver. Mr. Kareem Hassan Abdo Bresh is the happy owner of the Gold Champion Junior Colt, Sohail Al Yasser, by Hamra Aligance out of Waad Al Yasser. The Mazin Al Bidayer son Mazen Al Farida achieved Silver while Bronze went to AJ Barir, by Gazal Al Shaqab, owned by Khattab and Tahani. The Gold Champion Senior Stallion Sohaib Al Farida, bred and owned by Al Farida Stud, is no newcomer to the show ring: Sohaib Al Farida achieved several championships before, just in the tradition of his amazing sire Amaar Al Rayyan and his dam Psyches China Doll. The Hassan Ashiraf son Washiraf garnered Silver with Hamad, by Teymour B, owned by Al Bawady and Al Baydaa Stud, winning Bronze. The Rabab Championship brings together a mix of glamour and excitement. A sincere and heartfelt thanks goes to Sheikh Khaled Mohamed Awad Bin Laden, the breeders, owners, trainers, and handlers and to all the generous sponsors, who made this show possible. Thank you inviting the Arabian Horse Global Network to the Rabab Championship!